Faced with an unexpected CSA prize – an adorable pumpkin – I set out to find something fitting to do to this noble squash, aside from sitting it on the edge of my counter so I could ogle it daily, luxuriating in the little bit of Fall brought into my daily line of sight. 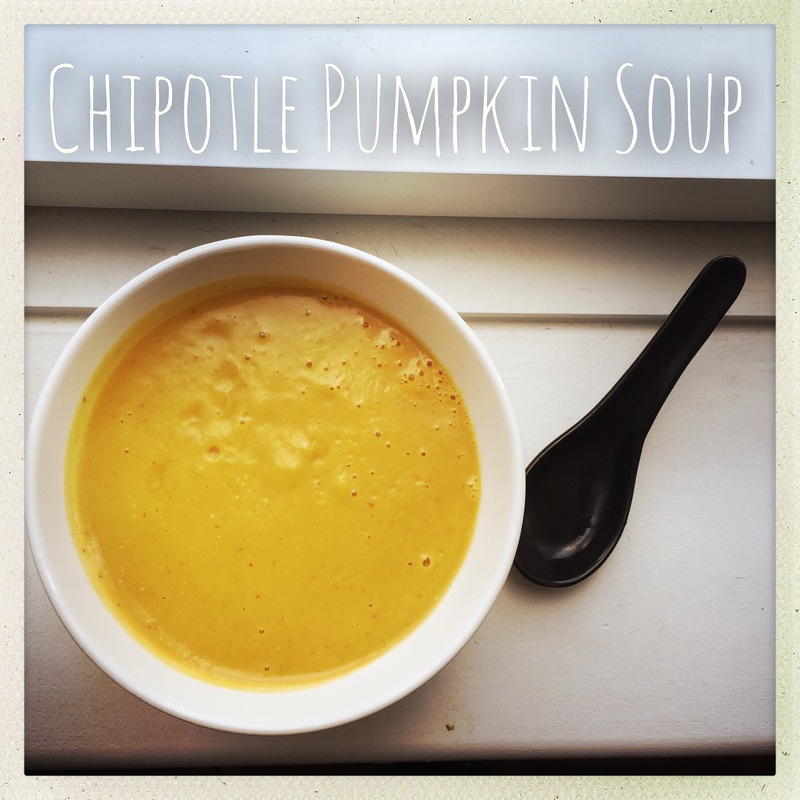 I researched pumpkin recipes high and low, got frustrated because it seems everything calls for canned pumpkin or butternut squash (because let’s face it: pumpkins are fickle, unpredictable bastards and a crap item to use in baking), or is a soup. I *always* make pumpkin soup. That’s because pumpkin soup is delicious. I settled on the flavors from one soup married to the flavors from another, with the cooking method of a third – and lo and behold, this soup was born. It’s hands-off lazy girl cooking at its finest, utilizing the crock pot and nothing else. And it smells divine while burbling away on the countertop all afternoon. Note: As written, this soup is on the liquidy side. If you like super thick soups, you could probably get away with halving the stock or maybe omitting altogether. Peel and chop your pumpkin into chunks. Add to a crock pot. Peel and chop the onion and garlic. Add. Chop the chipotle and add. Add the coconut milk, broth (mine was still frozen), cumin and oregano. Hit with 2 big pinches salt. When cooked and cooled a bit, blend (be careful – need I remind you that piping hot liquid + a blender is a recipe for disaster if one is not really really careful?). Taste. Add the juice of 1 lime and a couple pinches salt. Taste. Add more lime and/or salt as necessary. I used 2 limes + 6 big pinches salt and a smattering of white pepper. Serves 2 – 4, depending upon how large your servings are. Back to topic. This side is pretty great. The topping is sweet and salty and rich and a little crunchy – while the squash is a little sweet, soft and a touch velvety. The two play well nicely together. First, prep a baking sheet with tinfoil and set your oven to heat to 400 F.
Peel your squash with a vegetable peeler, cut into two easier-to-manage hunks, and cut into potato wedge looking sizes (scooping the guts from the bell end as you go). Lay on the prepped cookie sheet and drizzle a little coconut oil over. Toss well to coat. Sprinkle with kosher salt. Bake 30 minutes or until soft and just starting to brown a bit on the edges. While your squash is baking, make the crumbly goodness. Combine the pepitas, miso, maple syrup, vinegar, chili flakes & salt in the bowl of a food processor and pulse until combined and gravelly looking. Taste. The mixture should be weird but strangely delicious and addicting after the second taste or so. If you need to cut the weirdness, adding a little more maple syrup would work; adding some “warmer” spices (like cinnamon or pumpkin pie spice) may also help. I kept it weird. When your squash is done, move your rack up and kick the oven on to broil. 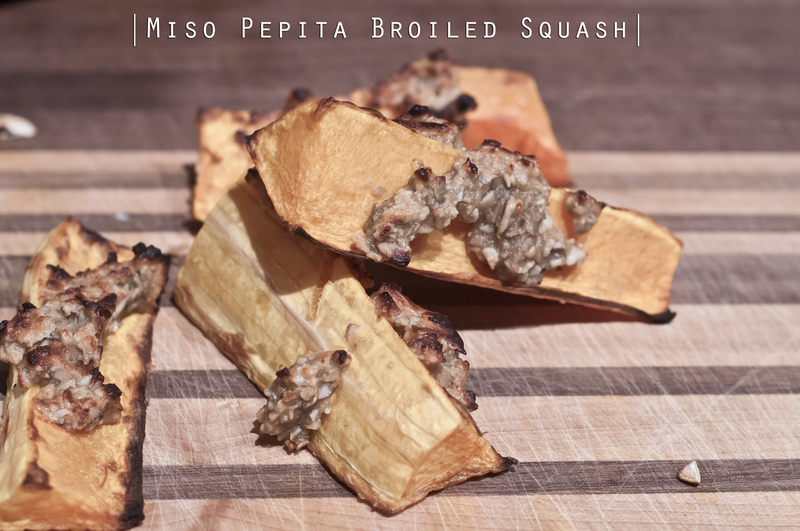 Top your squash with the miso pepita mixture – I used the whole batch when I made it (mostly because I was already obsessed with the taste, but in hindsight this was a wise choice). Broil 3 minutes or so, until the top is nice and crunchy and browned. 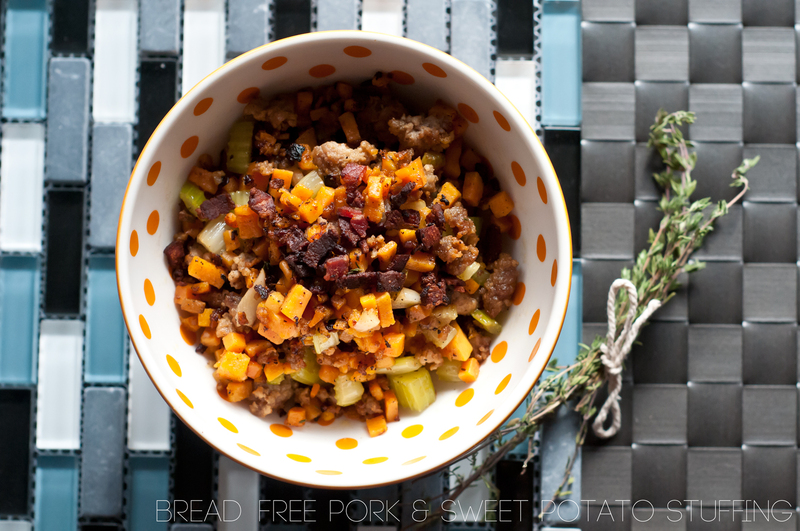 This dish screams fall all over. Orange! Apple! Bourbon! Pork! Bacon! And yum, don’t forget yum. Although this dish might look long and complicated, once you get going it is quick to prepare – and only dirties up a single pan + a small pot. Win-win. Blergh. Picture taking fail – no other pictures turned out. Add to a small pot over high heat. Boil until reduced by a third. Peel and dice the potatoes (about 1/4 inch cubes – I ended up with about 2 cups). Add to a medium pot and cover with the stock. Add the thyme and set over high heat. Boil 5 minutes, or until tender. When the potatoes are fork tender, drain – reserving about half a cup of cooking liquid – and add to a food processor. Mash with 2 tsp. chopped thyme, the chili powder and salt until smooth, adding splashes of reserved cooking liquid as you go. While your potatoes are boiling, fry the bacon until crispy and slice the apple thinly. 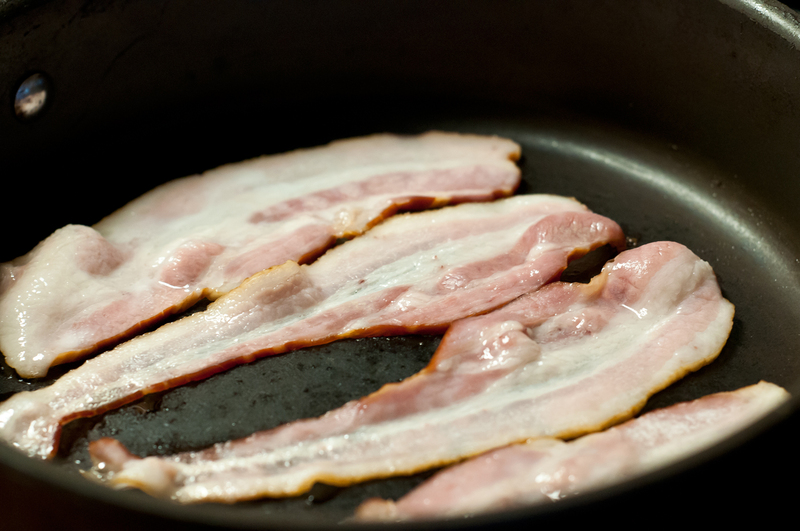 When the bacon is browned, remove from the pan and set aside to drain. Crumble and mix in with the mashed potatoes. To the hot pan, add the apple and fry in bacon fat until browned. Remove and set aside. Heat the coconut oil in the vacated pan over medium-high heat. Pat the chops dry with paper towels and liberally sprinkle with salt and pepper and thyme on both sides. When the pan is hot, add the chops and cook 3-4 minutes per side, or until done to your liking. Let the meat rest 5 minutes before serving.